As a premium member you will receive a commission payment when one of your readers purchases any of the products that are featured in the books that you give away or on the book download page. We will also use your AIOP affiliate link when new members that you introduce to List Builder pro sign up to AIOP. We are able to offer List Builder Pro for free because every book that you give away includes adverts for related products. These products are sold using our affiliate link, so when one of your readers buys a product we receive a commission. The commission is usually 50% to 75% of the sale price. Some of the products also include ongoing membership programs, for which we receive recurring commissions every month, for as long as the customer remains a member. As you can see, we benefit greatly from your free membership. When you upgrade your account to PREMIUM status all of these additional commissions are paid directly to you, instead of us. If you'd like to upgrade please click on the link below. The cost to upgrade is just $47 per month. If you ever decide to downgrade your account back to free status just let us know and we'll cancel your monthly subscription. Your ClickBank affiliate link will automatically be used for the product that is featured on the book download page. Your All In One Profits affiliate link will automatically be used when any member you introduce to List Builder Pro signs up to All In One Profits. Remember that every book invites the reader to join List Builder Pro, so you do not have to promote the system directly. The books will take care of that for you completely automatically. The cost to upgrade to premium membership is $47 (USD) per month. When you click on the 'Buy Now' button below you will be transfered to the secure server where you can make your payment using a credit card, debit card, PayPal or e-Check. If you are outside of the US, will see the cost in your local currency at the current exchange rate on the order processing page before your place your order. You can place your order with confidence. 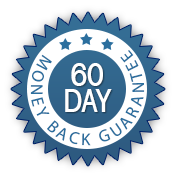 We offer an unconditional 60 day money back guarantee. So if you are not completely delighted with your order, for any reason, just let us know and we will refund every penny, no questions asked. If you ever decide to downgrade your membership from premium back to free just let us know and we will immediately cancel your monthly subscription. You are free to upgrade or downgrade your membership as often as you like.